The check-cashing and payday lending industries have long been marked for reforms because of the high interest rates they charge the working poor. But now even the middle class — college graduates who work and own homes — have trouble making ends meet and thus are taking out high-interest loans as well, writes Lisa Servon, University of Pennsylvania professor of city and regional planning, in her new book, The Unbanking Of America: How the New Middle Class Survives. Knowledge@Wharton: How much of an impact has the 2008 recession had on the U.S. banking regulation? Lisa Servon: Banks were subject to a lot of new regulation following the recession, such as the 2009 creation of the Consumer Financial Protection Bureau, and the  Dodd-Frank Act. Some of that is having a surprising effect in that banks feel like they got slapped so much for engaging in subprime loans and selling subprime credit cards that they’re actually retreating even more from that market because they fear they’ll get slapped again. That’s creating a problem for lower-income and moderate-income people who need affordable bank [loans]. Knowledge@Wharton: Even with the higher levels of regulation, banks feel they can get away with a lot, Wells Fargo being a perfect example. Servon: We see hundreds of millions of dollars levied in fines on [banks] — Wells Fargo in recent years, on Citibank for selling identity protection on accounts that didn’t exist — you name it. All four of the biggest banks and a lot of the other ones are continuing to engage in consumer practices that are simply not good for people, and sometimes are illegal. Knowledge@Wharton: A lot of times the fines are just a drop in the bucket because of their massive size. Servon: I liken it to FedEx. It’s part of FedEx’s business model to account for the parking tickets they pay for double parking. I think it’s the same for banks. It sounds like a lot of money to us, but it’s a very small percentage of their operating budget. 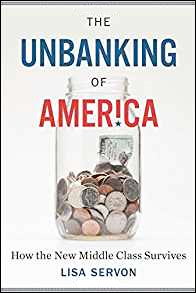 Knowledge@Wharton: For this book, you did the deep dive into the banking industry’s problems by actually going to work at some of these locations, such as payday lenders and check cashing facilities, to get an idea of the impact on the consumer. Servon: I was looking at reports from the FDIC (Federal Deposit Insurance Corporation) going back six years that were starting to count the number of people with bank accounts. People were classified as banked, unbanked and under-banked. Eight percent of Americans have no bank account at all. Another 20% are under-banked, which means they have a bank account, but we have no idea whether they use it. They’re also using alternative financial services like check cashers. The implication, if you read what the policy makers and consumer advocates say, is that something’s wrong. People are making the wrong decisions by making the choices that they do and not having a bank account. Check cashing and payday lending industries have skyrocketed in size. People who live in neighborhoods with low incomes know where every penny goes. So why are they making this choice? I felt like I needed to go as close as I could to the problem, or to the question, in order to answer it. Knowledge@Wharton: With some of these facilities, especially for check cashing, you’re paying for the right to cash your check. If you have a bank account you don’t pay anything to deposit your check into your account. Servon: That’s right. But one of the primary reasons people pay [check cashing facilities] to get their own money is that they can get it immediately. If you don’t have a lot of money in your bank account, time is money, right? If I get that paycheck on a Friday and put it in my bank account, it’s not going to clear until Wednesday. In the meantime, I need to pay bills, I need to buy food for my kids. If I write a check that goes through before my check clears, I’m going to get hit with an overdraft fee of more than $30 that’s definitely more costly than using the check casher. Knowledge@Wharton: It could also be businesspeople that have to pay employees in cash because maybe they’re undocumented workers, or something like that. So there are many reasons why people go this route instead of traditional banking. Servon: That’s right. I really wanted to shine a light on the situations that people are in. What I learned is that a bank account doesn’t work best for everyone. Given the situations that people are in, they’re actually making logical, rational decisions, a lot of the time. This isn’t necessarily to defend or advocate for alternative financial services providers, but rather to show that we lack good options. And those options — safe, affordable services are harder and harder to come by. Knowledge@Wharton: Are the big banks even thinking along the lines of being able to provide these other options for consumers so they could grow their base? Servon: That’s a great question. I had the same one. In order to figure that out I had to go to Washington and talk to many people working in banking policy — talk to bankers. After deregulation in the 1980s, banks could get bigger. They could merge [with other banks] or with insurance companies and other types of financial services firms, and create different products. Their income from accounts like yours and mine has become a smaller part of their overall income after they discovered [more opportunities for] fee income. Banks are shifting from a model based on interest income that fluctuated and was undependable, to one of fee income. That combination of moving farther away from the customer, making money in other ways, and then figuring out how to get as much fee income as possible created a model in which banks were working not so much in the public interest, but solely for profitability and often, as you mentioned, using deceptive practices to do it. Knowledge@Wharton: The other piece to this is the shift towards online banking in general. Servon: That’s right. I open the book with a story of going to the bank when I was a kid with my dad and getting a passbook and having it stamped. It’s like a relic now. You could put my passbook in a museum. That’s certainly not the kind of banking my kids have experienced. We go to the ATM and there’s a machine that spits out cash. For many, being able to bank online in pajamas has been incredibly convenient. But there are also things that have been lost as banks have grown bigger and farther from their customers. The relationship between the folks who work at the bank and the customer is one that has suffered. When I worked at RiteCheck in the Bronx and Check Center in Oakland, Calif., people talked about how they felt like they were poorly served by banks, and that they didn’t get good service when they had problems. The bank didn’t work hard to solve them. Knowledge@Wharton: You said in the book that many people hardly had any money left over once they cashed their check. Servon: There were a lot of surprises in doing this research, but one of them was that it wasn’t just these low-income people in the south Bronx who were suffering from that. As you know, the subtitle of the book is How The New Middle Class Survives. I found particularly in payday lending that there were a lot of people who had jobs, owned their homes, had college degrees and were still having a lot of trouble making it from paycheck to paycheck. Half of Americans now are living paycheck to paycheck. And half could not come up with $2,000 in the event of an emergency. That’s because we’ve seen this triple whammy of declining wages, increased income volatility, and the virtual disappearance of the public and private safety nets. So American workers, even if they have full time jobs, are in a much more tenuous position than they used to be. Knowledge@Wharton: Is the banking industry aware of this issue that is going on with many of their customers? Are they willing to consider working with them to try and alleviate the problem? Servon: Here’s where it’s not probably appropriate to talk about the whole banking industry as a block. Fifty percent of all of our deposits are in the four largest banks. So we do have this incredible concentration in the hands of a few banks. The other 6,000 banks share the rest of our deposits. That creates a situation where the big four have a lot of power. We do see some banks, like KeyBank, a super-regional bank that is trying to figure out ways to serve all of the customers in the neighborhoods where it works. One thing KeyBank does is, it has check cashing services in the lobbies of a lot of its bank [branches]. They’ve also come up with a small loan [product]. It’s not exactly a payday loan, but banks have stopped giving those $500 loans. I know my parents could go to Pulaski Savings and Loan and with practically just a handshake get a small loan. You can’t do that anymore. KeyBank is using its own data from its customers which gives it a lot more information than a payday lender would have to make a more affordable small loan for its consumers. What banks like KeyBank and many other small community banks and credit unions show is that you can actually do this and make a profit. You’re not going to maybe make the same [amount of] profits, but you’re not trying to simply maximize fees. Knowledge@Wharton: So then do they hold — pun intended — the key to the future of the banking industry? We’ve seen many community banks and small regional banks swallowed up by the Wells Fargos and the Citis of the world. Maybe we might see a shift back to the community bank. Servon: Yes. I wish I were so optimistic. There are models out there, but I don’t think there’s a lot of pressure on the big banks to adopt those models. It’s not just the big banks; some of the small banks are out there trying to maximize fee income, too. We need to be putting pressure on the banking industry to make the right choices. There has to be much more of a focus on corporate social responsibility. And as you mentioned, even with a lot of regulation we still see Wells [Fargo] doing what it did. At the end of the day consumers also have to recognize that they can move their money. Knowledge@Wharton: There’s also the concern that as we shift from one administration to the other, we may see more deregulation and changes that benefit the banks. It’s not that we’re going to go back to 2007-2008, but we could potentially head that way if we’re not careful. Servon: That’s a legitimate concern. One of the best things to come out of that Dodd-Frank legislation was the Consumer Finance Protection Bureau. There’s a real risk that it will be eviscerated by having its funding structure changed so that it doesn’t get as much money, or that the way that it’s governed moves from having a director to a board, which would make it a very political, less effective organization. One thing we can do is make sure that Americans know that the CFPB exists. That it’s saved billions of dollars for millions of consumers. That’s the organization that’s the watchdog for places like Wells Fargo, and also for the payday lenders and check cashers. Knowledge@Wharton: Payday lenders are organizations that have a bad reputation to begin with. Knowledge@Wharton: Payday lenders are prominent in towns where the military is located. Some of those military families don’t make a ton of money. Payday lenders as an entity need to be regulated even further, correct? Servon: Yes, absolutely. For listeners who don’t know what payday loans are I should give a quick definition. These are small loans, so usually in the range of $50 to $300. They are due in two to four weeks on the date of your next paycheck or government check, which is why they’re called payday loans. They carry pretty high fees. Where I worked, it cost $15 to take out a $100 loan. The APR (annual percentage rate) is somewhere between 300% and 600%. An overdraft is also a small loan. Here, you are borrowing money from the bank for a small amount of time until you can put that money back. If you calculated the APR on an overdraft, it’s about 5,000%. So you need to compare the two in that way. The problem with payday loans is that many people are not able to pay back the loan at that two-week or four-week mark and they roll it over. They show up, pay off the loan and take out that $100 [loan] again, immediately paying another $15. That’s where the argument between consumer advocates and the payday lenders really gets hot — that the product is not being used as it was designed. The CFPB is about to implement rules that would make lenders verify the ability to pay of the people who are coming in. That will level the playing field to some extent. In my research, the most important attribute of these loans to the borrowers is that they can get them immediately. You walk into the place, fill out a one-page application. [The payday lenders] check and make sure you have a bank account … and a job. Now, if Check Center and everybody else has to wait to verify income and make sure that person has the ability to pay and it’s not just about income, that will create an opportunity for other organizations like one I talk about in my book called Oportun to make small loans at a much lower interest rate. Oportun does it for about 36%. [That is] still expensive in some people’s eyes, but much lower than payday loans, and it competes with payday lenders. Knowledge@Wharton: So there’s innovation going on in this industry to be able to look at different options. Even if they’re not the perfect solution, they’re better than some of the other alternatives that are out there? Servon: That’s right. I had some payday lenders say to me, “I was surprised as anybody that we could do this, that this was legal, making these kinds of loans. They’re expensive loans.” The problem is, when we just focus on the lenders, again, we get away from the situations that people find themselves in. I write about a teller that I worked with — a woman who was making these loans every day. … She was a single mom. Her car broke down. She had to face the decision of either getting her car fixed and taking out loans to do it, or losing her job. So she takes out five payday loans ranging from $50 to $300. She knows when she takes them out that she won’t be able to pay them back right away. She gets her car fixed. She keeps going to work. When those loans start hitting her bank account she overdrafts. She then racks up hundreds of dollars in overdraft fees. So that’s an interesting relationship between the banks that are benefiting from payday loans too, right? I want to illuminate [the case of this woman] … deciding whether to keep her job or take out a loan. People are deciding whether to keep their father in a substandard assisted living facility or take out a loan to move them to someplace better. I’m assuming you and I are in places where we haven’t had to make those kinds of horrible choices. Knowledge@Wharton: The CFPB is looking to try and address those, but these have been going on for such a long time that you’ve got millions of Americans that are probably in this vicious cycle. Whatever relief they may get through the government, they probably needed it five years ago. Servon: That goes to the problem of declining conditions for American workers. Even if you wipe all of the payday lenders off the map and close them down you still have this need for small-dollar credit, and you still have the fact that all of these people can’t handle an income shock or an emergency need because there’s no buffer. Knowledge@Wharton: Some of these are issues that need to be discussed on the grander scale of the economy. The issues facing the middle class are another total topic. The middle class that we knew 20 years ago is no longer there. Servon: Right. I spent a lot of time talking to millennials and [thought of] what my parents were able to do. My parents were both teachers. They didn’t make a lot of money but it was a stable income and we did fine. My parents could buy a house, and they had good pensions. They could save at least to pay for some of my sister’s and my college education. When I talk to young people who are just coming out of college or graduate school, they didn’t feel like those goals were realistic for them anymore. I talked to a woman who had been in the Army for four years and owned a home, but had it foreclosed on. She kept making the mortgage payments for a long time because she put renters in and slept on someone’s couch. Then she loses her home. She still has a 780 credit score. But then she let’s go. She said the thing she protected above all else was the credit score. She loses that and now she says, you know, “my parents had the American dream but good for them, it’s not going to be for me.” The game has changed and yet we’re still holding up that ideal for people that if you work hard and go to school you can do this. It’s not realistic. Knowledge@Wharton: That ideal, I think, ends up sticking around because the baby boomer generation is still a very important part of our community. Once the baby boomers are no longer on the planet, the millennials will have a totally different view of what that American dream is, pass that new version onto their children, which is not what you want to see. Servon: The millennial generation is larger than the baby boomer generation. The four largest banks all make it to millennials’ Top 10 list of the most hated brands. Seventy percent of millennials would rather go to the dentist than talk to a banker. They’re also changing the financial industry with their dollars and their practices. The Consumer Financial Protection Bureau has proposed regulations to tighten several loopholes that are exploited by payday lenders and to curb some the issues with repayment of the loans. I think it’s an unfair stereotype that only poor people need these loans. They’re used by anyone who has a steady income yet that can not adequately cover the cost of living. Most of us have credit cards for that situation, but for anyone else, it’s payday loans. And that group of people is getting larger. A local check cashing service is also a liquor store and lottery agent. I stop by to play the lottery. I am amazed by the number of people cashing checks for a fee of 3, 4, or 5 %. I am not one of them because I have a healthy checking account and good retirement income. Besides the fees, customers pick up pint bottles of booze and a few lottery tickets. If they have any financial knowledge it sure doesn’t show. On one of my visits a dad brought in his teenage son to cash his first paycheck from his new job at a hamburger chain. I wanted to take him by the hand and walk him around the corner to the local bank to set up a checking account and not lose 5% to the store. For the folks who use the service, it is a way of life. They are the working poor or even middle class who can’t or won’t deal with a bank.